Queenstown tourism company Thunder Jet has been granted consent by the Environment Court to operate four jet boats on the lower Shotover River, carrying up to 34 passengers in each. Thunder Jet has been operating for five years. The court decision was released this month following a consent hearing mid-last year. Thunder Jet director and jet boat pioneer Neville Kelly said he was "thrilled" to get the good news. "It’s been a long two-year process to get to this point. We’ve proved to the court that we can safety operate in this area and are delighted we can now offer the Lower Shotover as an option." The Queenstown-based company is a family-owned and operated business with a 25 year history in the local tourism and transport industry. It also operates sister company Queenstown Water Taxis which provides a scheduled route between the DoubleTree by Hilton hotel and downtown Queenstown, as well as shuttle services for golfers, trampers, film crews and locals to access hard-to-reach areas like Cecil Peak across Lake Wakatipu. Thunder Jet has been operating for five years and in that time has expanded its business through market demand and the acquisition of high-speed, state-of-the-art jet boats. 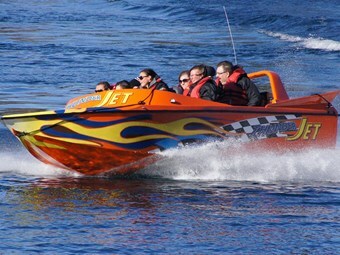 Thunder Jet’s most popular experience is its high-speed one-hour adventure from either Frankton Marina or Queenstown Bay. Passengers skim down Lake Wakatipu, twisting and turning at up to 90km an hour on the lake and in the clear, shallow waters of the Kawarau River. A drawcard is the river component where passengers see untouched, inaccessible and often dramatic natural scenery with a few of the famous Thunder Jet 360-degree ‘Hamilton’ spins thrown in for good measure. Mr Kelly, a Southlander who has been in Queenstown since 1986, said he and the team were passionate about jet boating, the local area and providing customers with an enjoyable and memorable ‘Kiwi’ experience. "This latest decision is testament to our ability to offer thrilling adventure experiences, to our impeccable safety record and to our high levels of customer service," he said. "Now that we’re able to extend our trips into this new area of the river we’ll announce details soon of our latest packages and amazing experiences." Mr Kelly said he had been in the industry for a long time and knew that Queenstown attracted people of all ages with a range of wishes. "We focus on offering each individual a great experience whether it’s a thrilling adventure or a simple transport service." For the latest motorhome reviews and road trip destinations, subscribe to Motorhomes, Caravans & Destinations magazine here.